London, UK. 28/7/10 - Journey into hell with Black Death when it arrives on Blu-ray and DVD on October 18, courtesy of Sony Pictures Home Entertainment. From director Christopher Smith (Triangle, Severance) and with an all star cast that includes Sean Bean (Lord of the Rings), Carice Van Houten (Valkeyrie), Eddie Redmayne (Elizabeth - Golden Age), David Warner (Planet of the Apes) and Tim McInnerny (Severance), Black Death is an action packed odyssey into evil. Both the Blu-ray and DVD contain special features, including the "Bringing Black Death to Life" featurette. The Blu-ray is packed with hours of exclusive features including director's commentary, interviews with cast and crew, behind the scenes footage and a photo gallery. 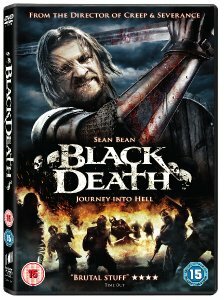 Black Death will be available on Blu-ray for RRP £22.99 and on DVD for RRP £15.99. Black Death has a run time of approximately 101 minutes (Blu-ray) and 97 minutes (DVD). The movie is rated 15.